Home Goodnews President Duterte No. 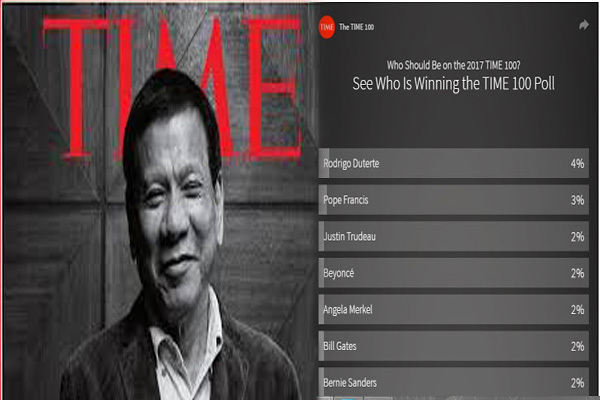 1 Sa Initial Poll Ng "Time 100 Most Influential People In The World 2017"! President Duterte No. 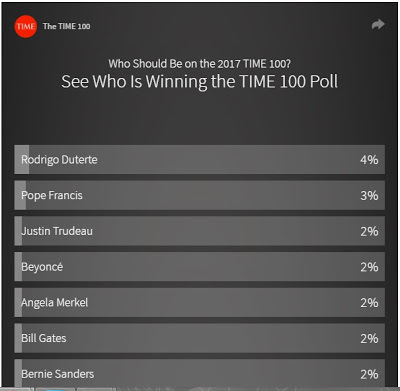 1 Sa Initial Poll Ng "Time 100 Most Influential People In The World 2017"! President Rodrigo Duterte is currently leading the online poll for Time magazine’s annual list of the 100 most influential people in the world. Duterte sat at the top spot gaining 4% votes as of Sunday after the poll started on Friday, March 24. With the poll still being in its early stage to declare a winner, it is a great honor for the Filipino people to have the President of the country as one of the strongest contenders in this year’s list. The Philippine leader who is soon to be 72 years old this March 28, has made international headlines in his controversial war on drugs, as well as his bold statement regarding the country’s “separation” from the United States and plans to realign the Philippines with China and Russia. Rounding up the shortlist’s top 10 were Canadian Prime Minister Justin Trudeau, music superstar Beyonce, German Chancellor Angela Merkel, US billionaire Bill Gates, US Senator Bernie Sanders, gymnast Simone Biles and women’s march co-chairs Linda Sarsour, Tamika Mallory, Carmen Perez, and Bob Inland. Sponsor Additionally, other world leaders also made it to the shortlist including Russian President Vladimir Putin, Mexican President Enrique Peña Nieto, and Chinese President Xi Jinping. The online voting will close on April 16, and subsequently, this year’s official Time 100 most influential people list will be announced April 20.